The location of Washington, in the middle of the nation (as it was in the 1790s), was a symbol of unity among states. Ratified by the states, the Constitution is a legal document that outlines the organization of the federal government, and in the Bill of Rights, guarantees individual freedoms. The Constitution is one of the oldest documents of its kind in the world. 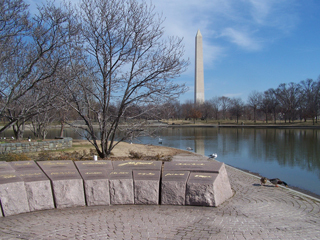 Constitution Gardens is a memorial to the Founding Fathers and their efforts to create a new nation. The land where the Gardens are located was originally part of the Potomac River, the shoreline of which followed Constitution Avenue, 17th Street, and Maine Avenue. In the late 1800s, the river was filled here. In the expansion of the government during World Wars I and II, buildings were put up on the site. The "temporary" buildings were used for several decades. They were finally demolished in 1971. The following year, President Richard Nixon announced that a formal park would be built. The firm Skidmore, Owings, and Merrill, Inc., designed the landscape to complement the presidential memorials nearby. The gardens encompass 52 acres, with a 6-acre artificial lake and a 1-acre wetland. On April 17, 1978, Congress authorized a memorial to the signers of the Declaration of Independence. The memorial consists of 56 low horizontal stones in 13 groups representing the original states of the Union. The memorial was dedicated in 1982.